We offer a variety of styles and forms, both traditional and modern. Our teaching style is adapted to the class and students’ profile, starting at the beginners level and reaching more advanced levels and more complex forms as the students progress in their practice. We teach classes for peace and serenity, for balance and harmony, for health and prevention, for rediscovering our connection with Nature, as well as advanced forms meant for muscle and tendons transformation and Alchemic inner development. We ultimately aim to awaken our True Nature and Eternal Self. Wu Style Tai Chi may be practiced in the long or short form. Our classes provide the practice of the short 18-form Wu Style Tai Chi, as well as Wu Style Qigong and Wu Style Meridian Stretching. The Integral Tai Chi method is a 9-movements Tai Chi form (practiced on each side) that integrates several of the traditional Yang, Chen, Sun, and Wu style movements, and can be practiced in several ways: stationary (standing or seated) or in combination with Tai Chi Walking. All traditional Tai Chi movements have martial application (e.g. self-defence), however, when practiced in the slow soft form for peace and tranquility, for healing and therapeutic benefits, for stress management and disease prevention, the focus is always aimed at relaxation, gentle movement and meditation. Simplified 5-movements version of the Integral Tai Chi form (practiced on each side), that is appropriate for people who wish to start practicing Tai Chi with no previous experience. Tai Chi Easy provides a good basis for learning and liking the Arts, as well as for further more advanced practice in traditional forms. The teaching method is very easy to understand and follow, developed in a structured and progressive sequence, that allows beginners to join in and follow along starting day 1 of practice. Revitalising Qigong practice – this method is formed of a set of warming up exercises, appropriate to practice at the beginning of every class, in order to bring the body, mind, and breath in the optimal state and to allow the Qi to circulate freely through the energy channels – the prerequisite for a successful and efficient Tai Chi and Qigong practice session. The method includes: standing meditation and intentful corrections for the body, breath and mind, gentle movements and progressive stretching exercises, mindful breath practice, and self-massage/tapping techniques. Alchemic Ten Phases of Qi Cultivation and Mastery – a beautiful and regenerating Soft Martial Arts practice, integrating an array of traditional ancient forms of Qigong, key principles of Chinese medicine and Mind-Body practice, as well as Daoist guidance toward awakening our True Nature and Eternal Self. Seven gestures Qigong form built on the basis of the old verbally-transmitted teaching, practice and legend of the “Golden Elixir of Eternal Life”, coming from the Oriental wisdom, that re-discovers and cultivates the “inner elixir” concept as the most highly refined essence of self, our “true nature”, expressing the profound truth of eternal being. Connective Tissues Transformation – ancient internal and external Martial Arts practice that strengthens your physical body (towards developing the Iron Shirt), and maintains the smooth circulation of Qi in the primary channels. We start with free-style Tendon Changing Qigong, to prepare the body, mind and breath, and continue with the 12-Classic Muscle/Tendon Changing form. Alchemic Qigong practice for “Marrow Cleansing” that helps us gather Qi from nature and purposefully store it in the marrow of the bones to vitalize organs and glands, to harmonize imbalances, and heal disease. Powerful practice for leading Qi to the marrow and keeping the marrow fresh, for slowing down the ageing process and the degeneration of the cells, then leading Qi to the brain and raising up the spirit and vitality. 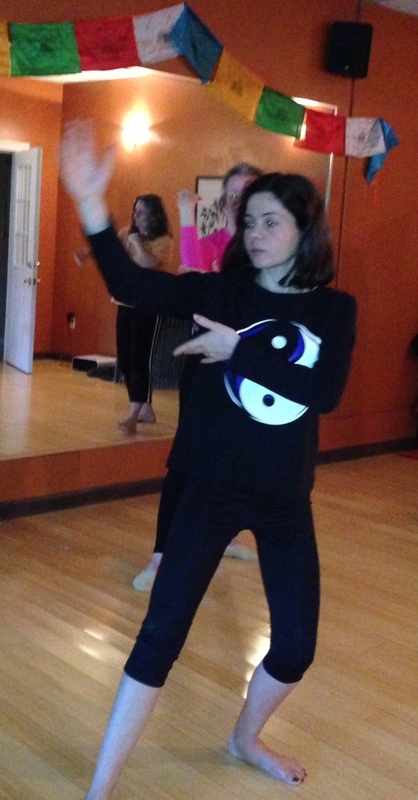 Traditional Health Qigong form that involves the coordination of movement and breathing patterns with specific healing sounds, in line with traditional Chinese Medicine theories (including the Five Elements and the Five Solid Viscera). The direction of body movements and mind follow the inner circulation law of meridians. Bringing an auspicious message associated with the cycles of life. Traditional practice and meditation of Shamanic (Daoist and Buddhist) origins, following the Four Cardinal Directions – experiencing timelessness and harmonising our practice with the seasons, attracting and embodying their particular qualities. An unique and life-transformational manifestation of Daoist Alchemy, introducing Primordial Qigong (Wuji Gong) and experimenting with “The descent of the dimensions”. Ancient Qigong form created by Hua Tuo – a leading physician of the Eastern Han Dynasty who lived around 200AD (the first Chinese surgeon and the inventor of the anaesthesia) – who developed these Health exercises by observing nature and the life of animals. The Five Animal Frolics practice involves coordinating breathing patterns with physical postures that imitate the movements of the animals, to maintain health and well-being. It helps to harmonize the flow of Qi in the body, strengthen the internal organs, and fortify the body, while cultivating the particular qualities and strengths of the chosen animals – the peacefulness and gracefulness of the Deer, the fierceness and ferociousness of the Tiger, the calmness, strength and stability of the Bear, the agility and suppleness of the Monkey, the lightness and balance of the Bird. Neidan, or Internal Daoist Alchemy (lit., “internal elixir”), called “The Way of the Golden Elixir” (jindan zhi dao) aims to produce the “elixir” within the alchemist’s person, using the primary components of the cosmos and the human being as ingredients. Neidan integrates spiritual teachings on the Dao (the Absolute, and the origin of the manifested world) with descriptions of physiological practices. Neidan uses meditation techniques, visualization, breathing and body exercises. Breathing exercises are used to preserve Jing (“life essence”) and body postures are used to improve the Qi flow (”vital energy”) in the body. Neidan techniques are based on the principles of Traditional Chinese Medicine and the cultivation of substances already present in the body, in particular the “Three Treasures” (Jing, Qi, Shen). Jindan, or Golden Elixir: Jin (“gold”) represents the state of constancy and immutability beyond the change and transiency that characterize the cosmos; Dan (“elixir” or ”essence”) represents the reality, the true nature of an entity, its most significant quality or property. Daoist Alchemy has a history of more than 2000 years, recorded from the 2nd century BCE to the present day. Neidan is believed to have been developed from the 8th century CE. Learn more about our Workshops ! Learn more about our Classes !